After drilling and blasting in the open pit uranium mine or underground mine, the hard rock uranium ore from the stope will be transported to the uranium ore processing plant. In the uranium ore processing plant, the uranium ore is delivered to the primary crushers, then the ores are normally processed by grinding the ore materials to a uniform particle size and then treating the ore to extract the uranium by chemical leaching. The milling process commonly yields dry powder-form material consisting of natural uranium, "yellowcake," which is sold on the uranium market as U3O8. Kazakhstan, Canada, and Australia are the top three producers, the other uranium producing countries are Namibia, Russia, Niger, Uzbekistan, and the United States. And South Australia operates the world's largest known uranium resource. 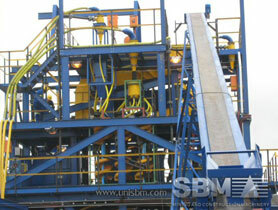 "SBM makes the practicality of crushing and grinding machine in uranium processing applications very economical."